Figure 2-17. - Gold or chrome fixed partial dentures (FPDs). Figure 2-18. - Root canal fillings (RCFs) and apicoectomy. the root amputation where the apicoectomy has been performed. The dentist will read the patient's radiograph to determine the level of the root amputation. Also note the (L) amalgam restoration on tooth #11. DECIDUOUS TEETH. - Occasionally, a deciduous tooth will be retained in the adult mouth. 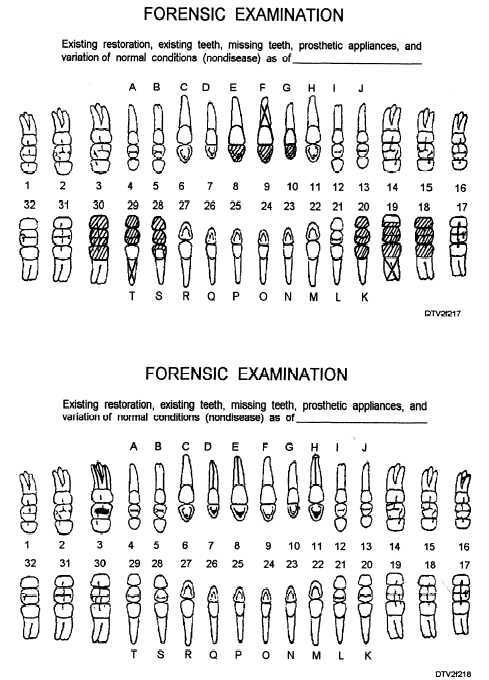 Circle the appropriate alphabetical designation on the Forensic and Current Status forms if deciduous teeth are present. Figure 2-19 illustrates a deciduous tooth #ll. SUPERNUMERARY TEETH. - These are extra teeth other than the normal 32 teeth that are present in the mouth. To chart a supernumerary tooth, draw an outline of the tooth in its approximate location. Then insert an "S" in the proper location on the tooth number line as shown in figure 2-19.